1. the projecting part of the ear lying outside the head; called also pinna. 2. the ear-shaped appendage of either atrium of the heart; formerly used to designate the entire atrium. 2. A feather, wing, or fin. 3. In veterinary anatomy, the moveable cartilage and associated fleshy structures of the ear located externally, outside the vertical ear canal. 1. Botany A leaflet or primary division of a pinnately compound leaf. 2. Zoology A feather, wing, fin, or similar appendage. 1. 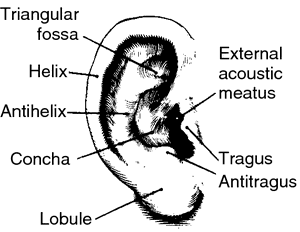 Synonym(s): auricle (1) . The visible external ear. The pinna consists of a skin flap on a skeleton of cartilage. It has comparatively little effect on the acuity of hearing. Also known as the auricle. the primary division of a leaf. the projecting part of the external ear of mammals. the projecting part of the ear lying outside the head; auricle. caryotifolia), from which he separated it on account of the spinulose fruits, the abundant yellowish spinules on the infructescence, the rachillae not curved at the insertion of each staminate flower, the larger fruits and fruiting perianth, and the pinnae more abruptly and strongly broadened. Multispore cultures on mineral agar medium (Dyer 1979) were established by sacking fertile pinnae on a weigh paper, and placing the obtained spores in the Petri dishes. Terminal segment of pinnules [lessthan]4x as long as wide; pinnae pubescent beneath. Several fragments of pinnae bearing subopposite relatively long pinnules have been first attributed to Callipteris uralensis by Doubinger and Heyler (1959), then to C.
Leaves are alternate, bipinnately compound with 2 to 5 pairs of pinnae and 10 to 15 pairs of leaflets per pinna (Lonard et al. Tissues of the pinnae are unusually well preserved (Fig. During the present study, these two forms occur notably as abscised pinnules, very rarely as ultimate pinnae of which three were collected. Since pinnae vary from person to person, each human brain must gradually learn the shape of its body's ears in order to process auditory information, scientists have theorized. HRTFs also preserve the spectral modifications wrought on the incident waveform by the pinnae, head, and torso before it reaches the basilar membrane. Psoroptes infection is characterized by extreme crusting, scaliness, scabbiness and itchiness of the external ear canal and pinnae, but the same clinical signs can be seen in lips, nose, neck, legs and sometimes around genitalia in case of Sarcoptes infestations. Leaves 12-25 forming a dense crown of glaucous-green color; sheath 41-65 cm long, petiole 43-105 cm long, rachis 134-162 cm long, sheath, petiole and rachis densely covered with a whitish appressed, persistent tomentum; pinnae 85-98 on each side of rachis, strongly grouped and arranged in different planes in the proximal 1/3 of rachis, regularly arranged in one plane in the distal part; adaxial surface glabrous, abaxial surface covered with an appressed indument, initially golden-brown, aging whitish, proximal pinnae 37-57cm long, 0. 5-5 cm, pinnate, lanceolate, truncate to scarcely reduced at the base, acuminate at apex, glabrous; rachis similar to stipe; pinnae 1-3 x 0.